In December 1988, the Samford Board of Trustees voted to name the school the Beeson School of Divinity in honor of Ralph Waldo Beeson and his late father, John Wesley Beeson. Ralph Beeson provided the largest gift from a living individual in Samford history to establish the only divinity school at that time at a Baptist college or university in the nation. In its first year, Beeson School of Divinity secured the dean, four full-time faculty, and two adjunctive faculty, and enrolled 32 students. The School of Divinity, like other entities of Samford University, is open to persons from all denominations. The confessional context in which the faculty teaches is defined by the Baptist Faith and Message Statement of 1963. The school offers quality theological education in a Christian university setting from an explicitly evangelical perspective. Non-Baptist faculty teach in accordance with their own convictions on matters of denominational distinctives. Below and at right are brief summaries of the degree requirements for the M.A.T.S., M.Div. and D.Min. degrees, the certificate of Anglican studies, the certificate in missions, as well as available joint degrees. Students seeking to enter a joint degree program must meet admission requirements for both schools participating in the joint program. 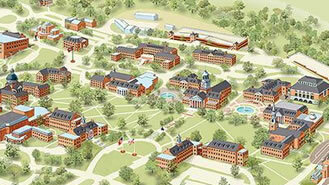 Please refer to the Beeson School of Divinity Bulletin for further information on all curricular listings. To obtain a divinity school bulletin, application forms, or additional information, write the Director of Admissions, Beeson School of Divinity, Samford University, Birmingham, Alabama 35229, or call 1-877-575-0595 or (205) 726-2066. The M.A.T.S./J.D. joint-degree program, offered in collaboration between the Beeson School of Divinity and the Cumberland School of Law, allows students to use credits from each school as part of the other school’s degree, thereby reducing the total number of hours for the two degrees combined. Students must complete their first year of law school before beginning work in the divinity school. The M.A.T.S./M.S.W. joint-degree program, offered in collaboration between the Beeson School of Divinity and the School of Public Health, allows students to use credits from each school as part of the other school’s degree, thereby reducing the total number of hours for the two degrees combined by 12. This 88-hour program takes approximately three years to complete. Students must complete at least 24 hours in the M.A.T.S. program before beginning work in the M.S.W. program. This requirement constitutes one year of full-time study in the Divinity School. Students must apply for admission to each school separately. This joint program will prepare students for ministry in settings that require theological training as well as knowledge and skills related to social service provision. The M.Div./J.D. joint-degree program, offered in collaboration between the Beeson School of Divinity and the Cumberland School of Law, allows students to use credits from each school as part of the other school’s degree, thereby reducing the total number of hours for the two degrees combined. Students must complete their first year of law school before beginning work in the divinity school. The M.Div./M.B.A. joint-degree program, offered in collaboration between the Beeson School of Divinity and the Brock School of Business, allows students to use credits from each school as part of the other school’s degree, thereby reducing the total number of hours for the two degrees combined. The program is designed to enrich the educational opportunities available to students in the separate disciplines by encouraging interdisciplinary approaches to ministry preparation and organizational problems that directly impact churches and other religious institutions. Students interested in this joint program should apply to the School of Business for admission into the M.B.A. program at the conclusion of the first year of the M.Div. program. Contact the Beeson School of Divinity for more information. The M.Div./M.M. joint-degree program, offered in collaboration between the Beeson School of Divinity and with the School of the Arts, allows students to use credits from each school as part of the other school’s degree thereby reducing the total number of hours for the two degrees combined. Divinity students must qualify for admission to the M.M. program no later than the beginning of the third semester of M.Div. work. The M.Div./M.S.E. joint-degree program, offered in collaboration between the Beeson School of Divinity and the Orlean Beeson School of Education allows students to use credits from each school as part of the other school’s degree, thereby reducing the total number of hours for the two degrees combined. Twelve credits of education-degree coursework are accepted as part of the elective requirement of the M.Div. degree. Crossover credit from the divinity degree to the education degree is determined on a case-by-case basis, as allowed within government regulations concerning teacher certification. Students normally are required to complete the first year of the M.Div. program before beginning work in the School of Education. The M.Div./M.S.W. joint-degree program, offered in collaboration between the Beeson School of Divinity and the School of Public Health, allows students to use credits from each school as part of the other school’s degree, thereby reducing the total number of hours for the two degrees combined by 18. In addition, students in the M.Div./M.S.W. program are eligible to complete the required internships for both programs simultaneously in an approved church or ministry setting. Although this option does not further lower the credit requirement for either program, it does allow students to save time by completing two internship requirements simultaneously. This 135-hour program takes four to five years to complete. Students must complete at least 24 hours in the M.Div. program before beginning work in the M.S.W. program. This requirement constitutes one year of full-time study in the Divinity School. Students must apply for admission to each school separately. This joint program will prepare students for ministry in settings that require extensive theological training as well as knowledge and skills related to social service provision. A certificate of Anglican studies will be awarded to students who successfully complete at least 15 hours of their master of Divinity (M.Div.) degree in courses that are either specifically Anglican in content or have a significant Anglican component. For more information contact Dr. Gerald McDermott, professor of Anglican studies. A certificate in missions will be awarded to students who successfully complete at least 15 hours of their master of divinity (M.Div.) degree in courses dedicated to Christian missions (DVMS) and cross-cultural ministry (DVCC), as part of the 93-hour M.Div. degree. They will be required to spend a minimum of six consecutive weeks in the field, engaged in cross-cultural ministry. These students will also complete their supervised ministry practicum in a one-year training experience in the Birmingham area designed to provide training for cross-cultural missions. For more information contact the Global Center at Beeson Divinity School. The Global Center in the Beeson School of Divinity exists to help people know their world, help people serve God in the world, and help the world know God through Jesus Christ. It serves as an education center for the worldwide Christian movement, and a networking and research center for those involved in missions. The Global Center exhibit area highlights cross-cultural Christian witness, and major issues of global concern for the twenty-first century. The Global Center hosts several World Christianity and missions education and/or mobilization events each semester that are open to the public as well as students. Global Center staff members are involved in teaching; speaking in churches and academic settings; facilitating short-term missions for students, and prayerfully supporting our Beeson Divinity alumni serving in missions. Go to information for Divinity.